I have previously visited the Victoria Room in the past for their famous high tea, but was pleased to be invited along to sample their new menu and check out their updated surrounds. I really loved the new British-India themed interior, a theme I haven’t seen very much of in other restaurants. Picture gorgeous vintage couches dotted about the place, with just a hint of traditional English and Indian themes in the lamps, restaurant seating and more. I just love fusion cultures (heck I am one myself!) It’s the type of place you’d love to swoon on one of the couches in an 1800’s style corset gown, when the day has just become too much and only a cup of tea and cake will make it better. Simply stunning interior. Whoever designed this place has done a fabulous job! 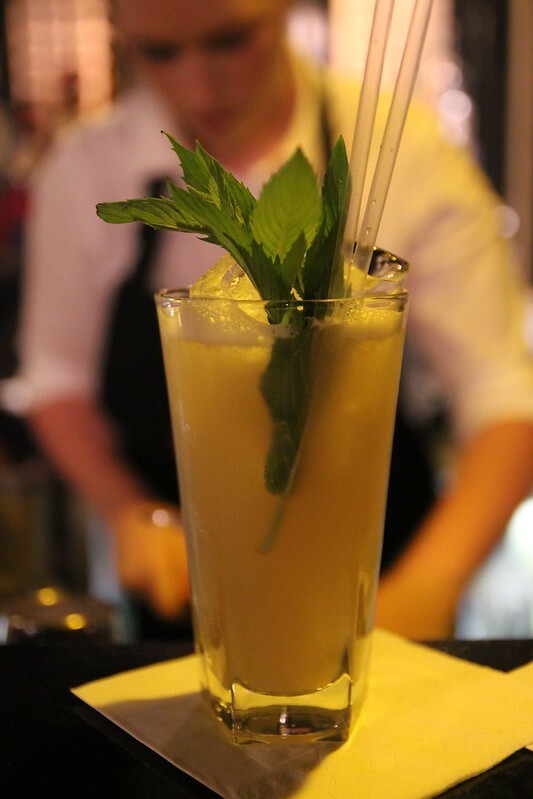 Unfortunately the bar was out of sugar cane juice when we ordered this one (they subbed it with something else) but it was a very pleasantly refreshing drink – but I definitely preferred the English Rose. 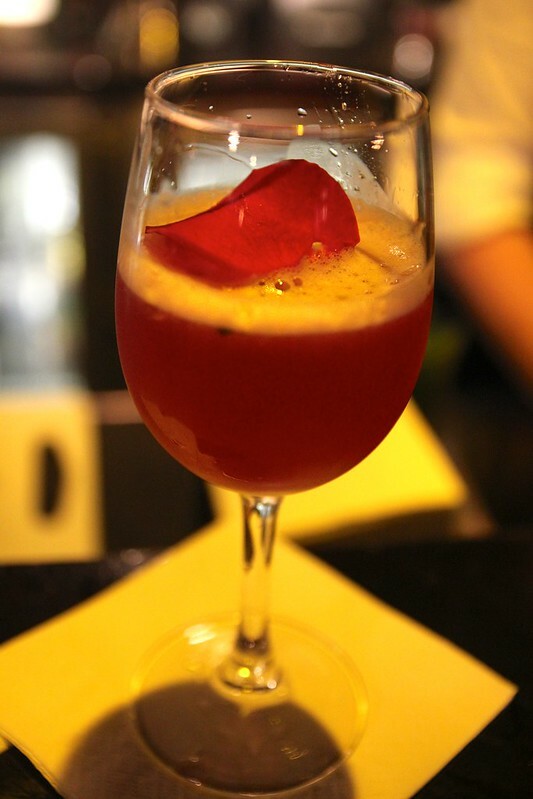 I absolutely love rose in anything these days and so this mocktail was perfect for me. The dusky flavour of the rose shone with the cranberry and lime and I loved the dainty touch of the rose petal for presentation. My husband had never previously tasted fried zucchini flowers before and boy, was he in for a treat! 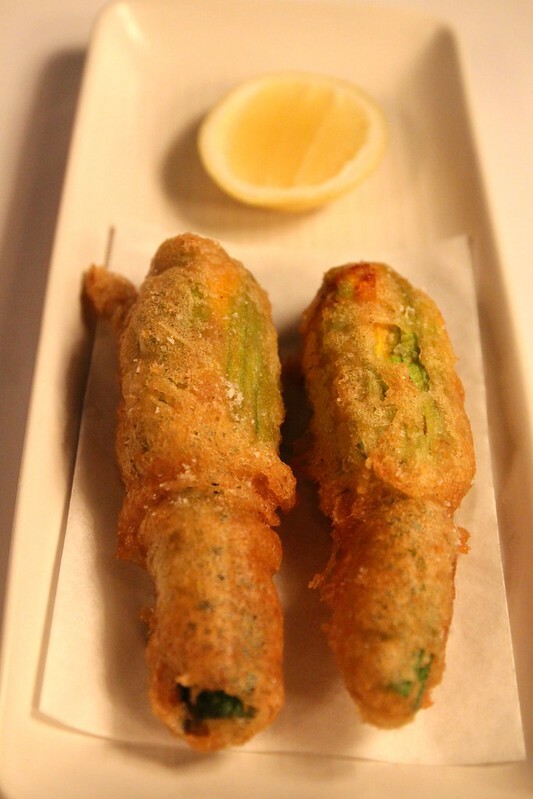 Zucchini flowers are by far one of my most favourite dishes (and why not? that crispy outer, the delicate creamy innards and that beautiful young zucchini flavour all shine together so magically). This particular dish jazzed things up a little by including raisins, pine nuts and honey for a bit of a change, which I thought worked beautifully. The raisins added a beautiful hit of sweetness which contrasted so well with the ricotta, nuttiness from the pine nuts and the fried batter. It was a great start to the meal and it had us wishing we ordered more. While perusing the menu, we decided to go for chicken and lamb for our main course and thought to order this salad to add a bit of much needed freshness. It arrived at our table all green and gleaming prettily and it tasted as good as it looked. 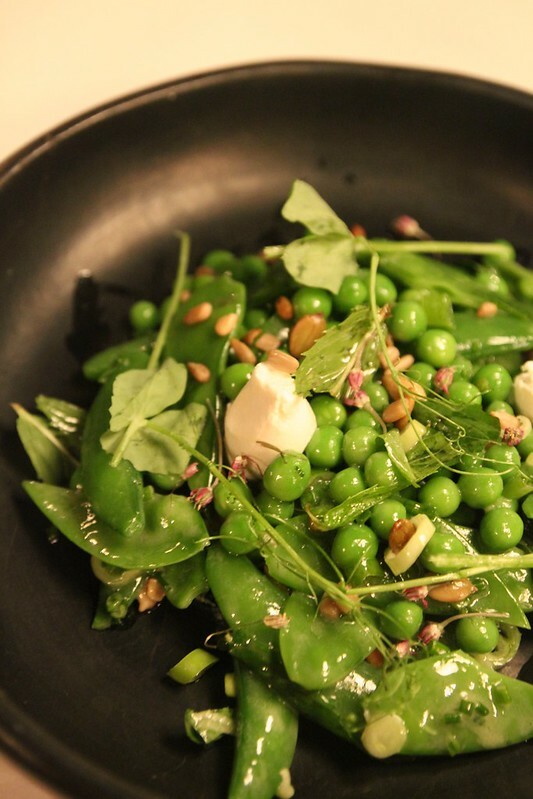 The peas were gorgeously light and fresh (very different to the frozen peas at home I’m sure we’re all used to!) and were the perfect accompaniment to our main meals. I also really enjoyed the creaminess of the goats curd scattered throughout the salad – which had just the perfect amount – not to much to overwhelm the delicate salad. This dish was a beautiful example of the flavour you can really bring out in chicken when cooked the right way. Juicy, with crisp skin and nothing overly obvious to overwhelm the flavour of what really good chicken tastes like just on its own. I tend to forget how great chicken can taste on its lonesome, as I tend to cook chicken at home with herbs, spices and a multitude of other flavours rather than just grill it on its own, which makes it easy to forget that it has a really complex and lovely flavour on its own when done right! This dish left barbecued supermarket bags of roast chooks eating its dust. 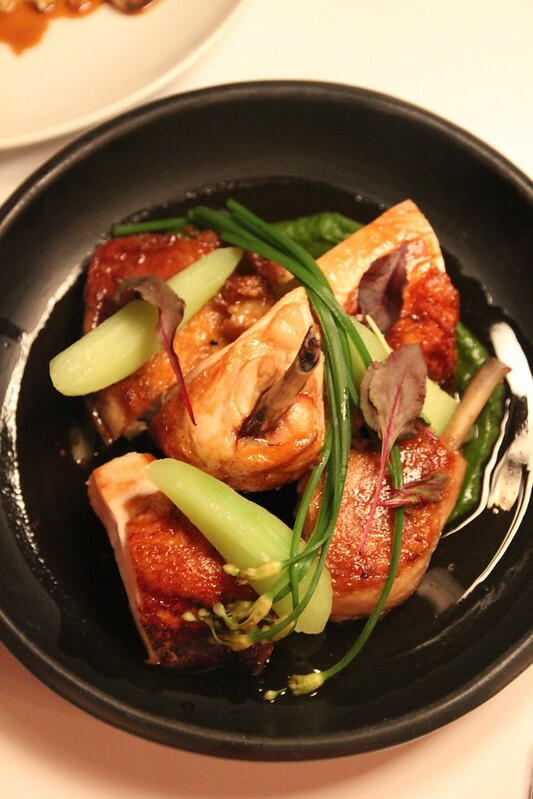 The free range chicken was served with a beautiful herby sauce, buttered chokos and garlic chives which I felt really complemented the dish but still allowed the flavour of the chicken to shine through as the star of the dish. I felt especially nostalgic consuming chokos, which I haven’t eaten since I was a child in my mother’s spicy sour fish soups. Glad to see this vegetable making a little comeback! Its not an especially flavoursome vegetable, but it can definitely be used to complement dishes in its own special way as well as bringing an interesting texture to the dish. This was a very smokey dish – with the chargrilled eggplant lending a hand, but the lamb loin tasted as though it had notes of its own smokiness too. The burnt onion gave a beautiful note of sweetness to the tender lamb that was cooked to pink perfection. This dish also paired very well with the pea salad, although I think we both preferred the chicken dish. Wow. This was definitely my favourite dish of the evening and I daydream about eating bowlfuls of these salt baked potatoes. Just thinking of it makes my mouth water as I write this. I think what made this dish so especially good was the smoked sour cream, which I have never had prior to sampling this dish. 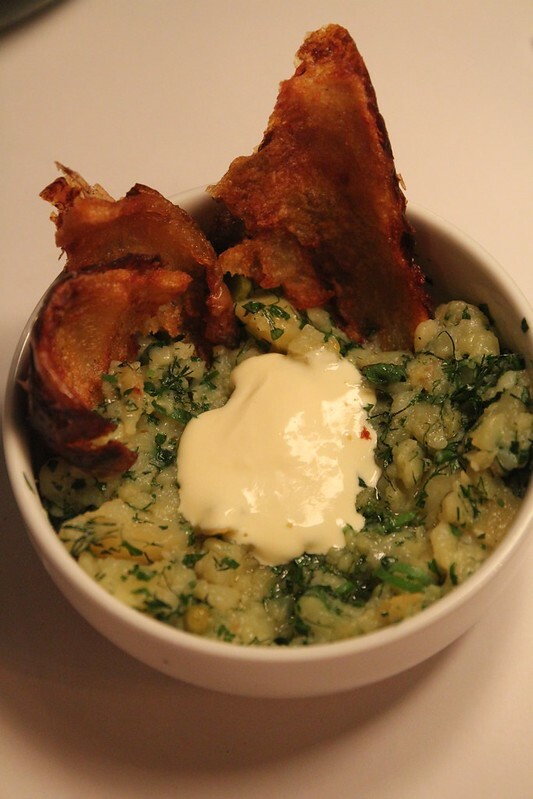 I adore smoky dishes and the sour cream lent an unbelievable flavour to this dish. This dish is intended for you to use the fried potato skins to scoop up the soft potato (to eat sort of like nachos) for you to devour. My first bite shattered it in my mouth from the crispiness of the potato skins and melted with the super soft and incredibly flavoursome potatoes. The smokiness spread throughout the dish in such a way that convinced us the potato skins had been fried in bacon fat. Buttery, herby and with a gorgeous zing from the preserved lemon, this dish was a knockout and to-die-for good. This is one of those memorable dishes really stay with you! The first thing about this dish that caught my eye was the size. It was a much more generous serving than I expected. I definitely recommend this dish is shared between two as one person may struggle to finish it off. After our large meal, I didn’t even think the two of us (with a second dessert especially on the way) could finish off this plate of doughnuts, but they were so ridiculously moreish that armed with a cup of creamy chai – we finished them off in no time! I adored the airy chantilly cream, which was surprisingly whipped with the jam, instead of them being served in separate dipping dishes. A great idea that I think would be perfect to pair with scones. The doughnuts were served warm (as promised) and were lovely and soft on the inside. Coated with that signature doughnut mixture of cinnamon and sugar, then dipped in the jammy chantilly made this dessert incredibly satisfying. I would call this dessert more of a deconstructed cheesecake rather than a mousse. The texture of the mascarpone was much more dense and less airy than a mousse. Nonetheless, it was certainly a crowd pleaser for the two of us. To be completely honest, my husband absolutely despises mousse (he dislikes the airy texture – bizarre, I know!) and he enjoys cheesecake, so this dessert was a win for him. I too really loved the creaminess of the mascarpone with the gorgeous texture of the buttery rich biscuits (that reminded me a little bit of digestive biscuits, but with more butter!) 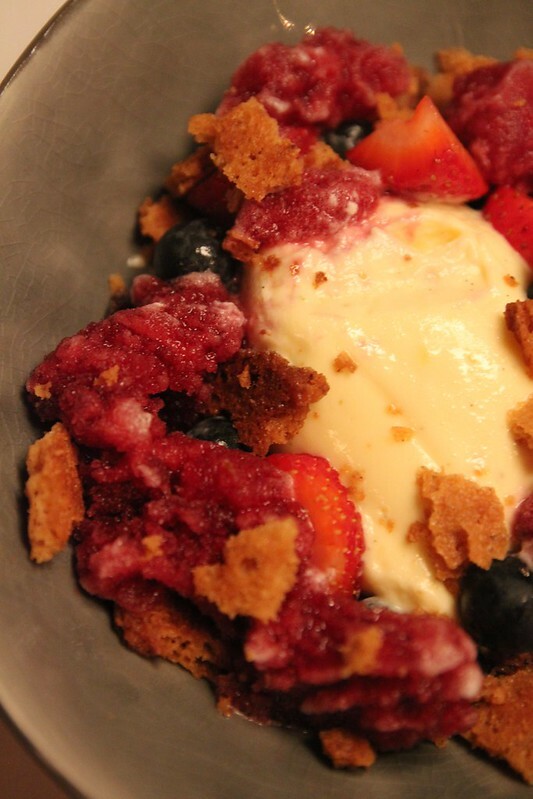 with the tartness of the berries which really helped to temper the richness of the dessert. The verbena and berry granita, the burnt butter biscuit and mascarpone all came together the way a good cheesecake should – buttery, creamy and tart. A match made in heaven. Right next door to Gelato Messina if you have room after dinner! High price for dinner, but definitely justified by quality of dishes and location. Somewhere to save for a special occasion! Difficult to find low-cost parking, but a short walk from Kings’ Cross train station for access. Difficult to access for wheelchairs (as far as I could see). I really enjoyed my experience at the Victoria Room. Each dish we ordered I found very hard to find even the smallest fault in. The food is clearly of very high quality and the menu is well thought out – the Victoria Room is serious about delivering a great meal to its customers and it sure delivers on that. I would love to return for dinner soon, or if not, definitely to indulge in their high tea! Dishes to definitely try include the crispy zucchini flowers and salt baked potatoes – you won’t regret it! Cooking Crusade dined as a guest of Mike and Dea Manassen, but the opinions in this post are my own. Thank you to the Trish Nicol Agency for help in organising my visit. I love Cocktails and the Komodo would have been my choice. The food looks delicious. As I am not really much of a lamb fan , I would have tried the Lamb Loin. It looks like it would have changed my mind about Lamb all together. ooh! this looks good, i still havent made it for their high tea yet! only been there for drinks once before. the food looks really yummy to try! 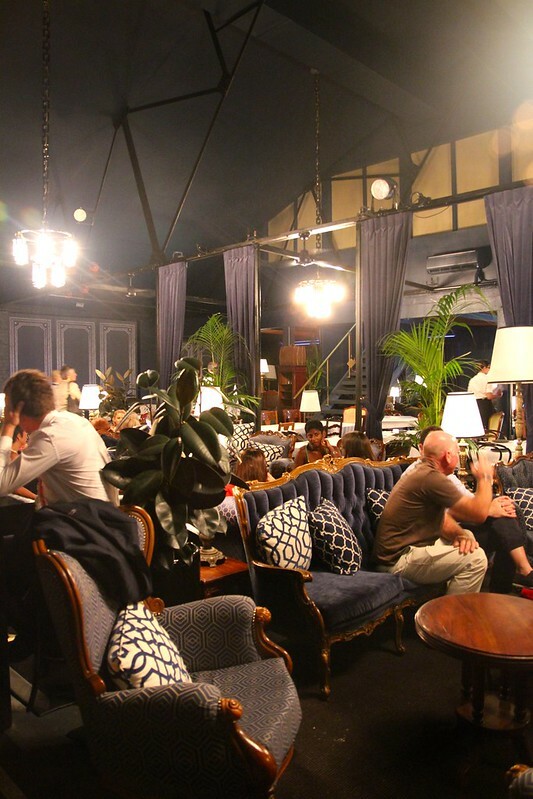 I love the Victoria Room, Haven’t been for a year of so, but it has always been one of my favourites in Sydney! Burned onion and labne with the lamb sounds interesting. Oh wow! Those donuts! Mmm, looks delicious! Love the look of how fresh the salad is. The decor is way swanky! 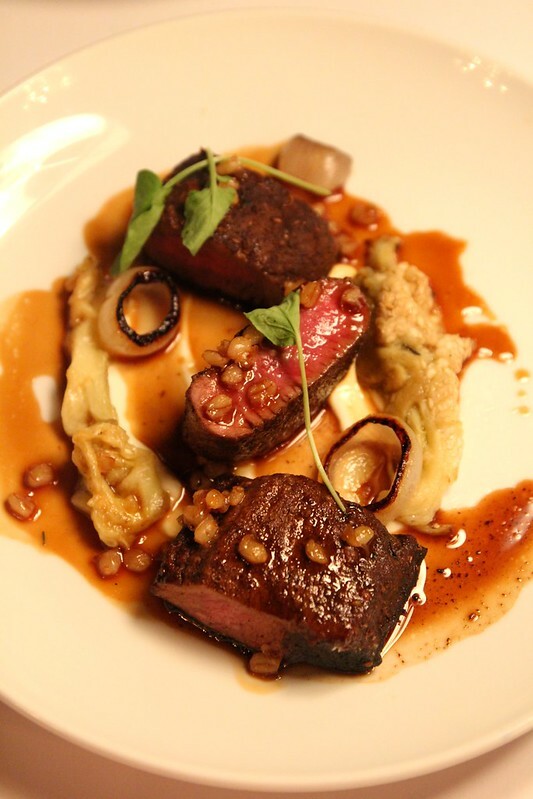 I’d happily gun down the lamb loin…love the rareness. 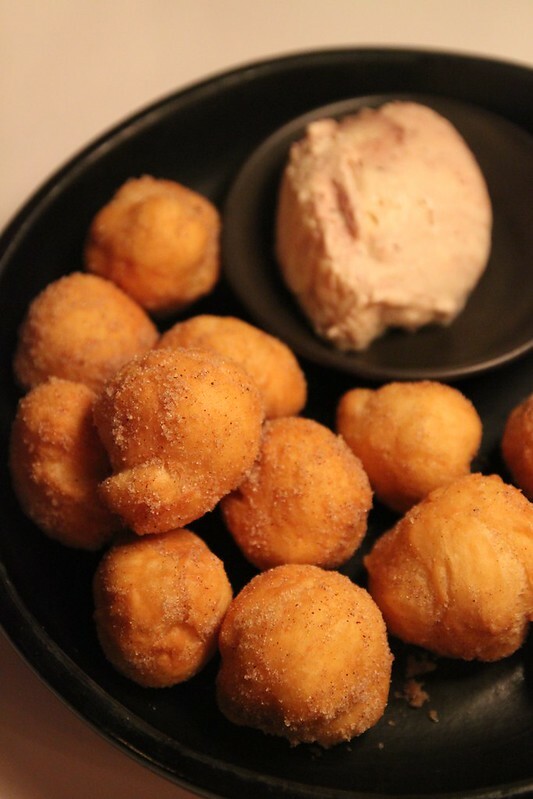 Tge doughnuts – yes please!